It’s rare that a company can stay relatively secretive while raising a huge amount of funding, but Florida’s Magic Leap has managed that. The startup, led by CEO Rony Abovitz, announced today the close of its $542 million Series B, featuring investors led by Google, Inc., and including KPCB, Andreessen Horowitz, Obvious Ventures, Qualcomm and Legendary Entertainment. The list of investors reads like a who’s who of influential companies and individuals across various industries, and Abovitz explained to TechCrunch that the reason for that is that the tech’s potential isn’t limited to any one field, which he says puts its potential market size in the trillions of dollars annually range. That could explain the valuation of Magic Leap, which is north of $1 billion, given that this round is still a minority investment, per Abovitz. But what is Magic Leap? It’s a question that the startup isn’t answering in detail just yet, though they are pulling back the curtain just a little more than they have in the past with this fresh funding. 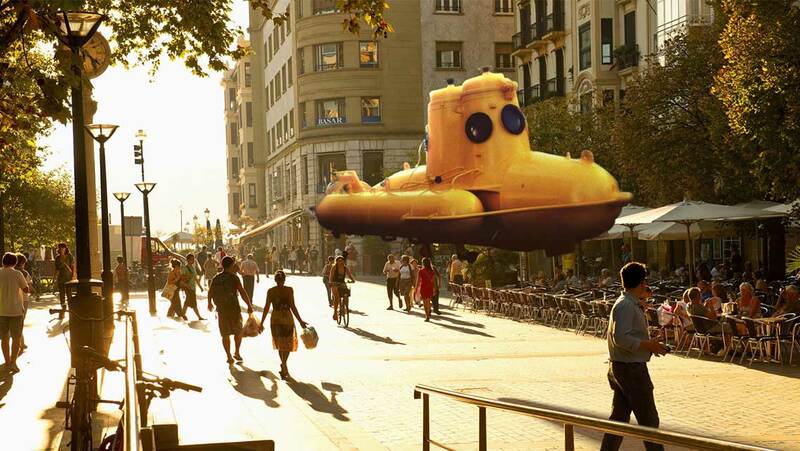 Magic Leap, then, is combining that inherent visual ability with mobile computing – giving you visual output equivalent to when you step outside into the world, but powered by the mobile tech you carry around. Nor will this be something that involves a huge head-mounted display, Oculus Rift-style, Abovitz is keen to note – he characterized it as a “lightweight wearable” hardware solution, though he wouldn’t go into further detail about what exactly that meant. Based on his comments, it sounds like artificial, but extremely realistic images like the one shown in the image above might be projected directly onto a user’s retina to achieve this effect, but we may have to wait until an official reveal to learn more about the nature of the device(s) in use here. What Abovitz would tell me is that they think of Magic Leap’s capabilities in terms of both the phrases “the world is your new desktop,” and “the world is your new silver screen,” meaning it provides a visual experience not bound by traditional media content consumption devices. The use of both those phrases also hints at some of the potential markets for the tech – silver screen includes Hollywood in the mix, which helps explain why both Legendary Pictures, and Legendary Pictures CEO Thomas Tull personally invested in Magic Leap as part of this round. Abovitz, for his part, says that Magic Leap isn’t like Oculus, in that it’s not truly a VR experience. Nor is it an augmented reality situation, he claims, since it goes well beyond that and provides truly integrated, 3D digital objects that looks as though they were physical objects, alongside the real world. He likens Magic Leap compared to other AR-type tech to a situation whereby, if you’d come to see the Wright Brothers fly their original airplane in 1903, only to learn that someone else was building a jet in the next hangar over. Google is a key investment partner here, and Google’s Sundar Pichai, who leads Android and Chrome, will join Magic Leap’s board as part of the deal. Qualcomm Executive Chairman Paul Jacobs and Google VP of Corporate Development will as join the board in observatory capacity, so you can tell the industry will be watching what Magic Leap can do closely. Abovitz says that contrary to some speculation, however, this isn’t just about adding a feature to Google Glass – in fact, he says they’re completely separate and unrelated projects, and will remain so, though he did say Magic Leap springs from a belief that we spend too much time looking at our phones and not enough looking at the world, which is similar to Sergey Brin’s stated motivation in creating Glass. Magic Leap should become more of a known quantity with a consumer launch “relatively soon” per Abovitz, and the investment is going to be focused specifically into product development, which can be pricey when you’re building hardware. He also says that while he admires Oculus Rift’s ‘iterate in the open’ product development strategy, Magic Leap will not be going down the same path, so it’s possible than when we see product revealed it’ll be available for general consumption shortly after. Whatever comes out of Magic Leap, it’s bound to be worth watching, given how much money and attention it has garnered from some of the smartest and most successful minds across computing, film and technology thus far.